Best for: People who enjoy good writing about medical issues. NOT for those who get squeamish reading about surgical procedures. In a nutshell: Surgeon Atul Gawande (you probably know him from Being Mortal; I think my favorite of his is the Checklist Manifesto) shares stories about his time as a surgeon, exploring the reality that surgeons are humans and make mistakes. Why I chose it: I can’t believe I haven’t read this yet – I thought I’d read all of his books. So when I sorted my Goodreads list for this CBR10 I was shocked to see it on there. I worried I’d start reading it and realize I’d read it before, but nope. It was new to me! First off – CANNONBALL! My sixth since I started with CBR 5. Ah, how the time flies. I enjoyed this book. I think it could have been better organized, but any time I get to read Dr. Gawande’s writing, I know I’m going to learn something and I’m going to enjoy reading it. He’s so talented, it seems unfair – a surgeon who can also write, and write well? This book explores, through three distinct parts, the challenges of medicine that arise because humans are humans who need to learn and who make mistakes. The first section looks at learning and mistakes, the second at trying (and sometimes failing) to solve medical mysteries, and the third focuses on indecision. 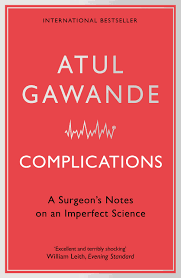 The book starts off intensely, with Gawande sharing how he learned to put in a central line. It’s quite graphic, and does a great job of getting across the point that we all know somewhere in our mind (or every Thursday night when we watch Grey’s Anatomy): that doctors have to learn somehow. And usually that means performing on patients who are sick and injured. As patients, we want the best to treat us and our families, but the best only get there by practicing, which means that at some point we’re going to get the worst. The second section, on medical mysterious, explores the frustration of healthcare professionals and patients when there is something wrong but we don’t know the cause and don’t know how to fix it. Like, for example, the woman who had nearly uncontrollable nausea for her ENTIRE PREGNANCY. Basically, what the Duchess of Cambridge had, but apparently it never stopped. I just … ack. The final section is a reminder of the fact that sometimes, doctors just don’t know exactly what to do. The last chapter illustrates this amazingly well, with a woman who either has cellulitis or flesh-eating bacteria, and the doctors — and the patient — need to make a decision on the path forward. It looks at how much should doctors be directing care and how much should patients be? How do you find a compromise that respects the choice of the patient but also the knowledge and experience of the doctor? Like I said, it’s an interesting book. It’s not a five-star read for me mostly because the chapters aren’t as well-connected as they could be. But it’s a strong four, because it’s Gawande. Share the post "Cannonballing With My Favorite Genre: Medical Memoir (CBR10 BINGO)"
Happy Cannonball! My boss gave me his copy of The Checklist Manifesto to read several years ago, and I have not touched it. I feel bad. Should probably get on that . . . Happy Cannonball! I really enjoyed The Checklist Manifesto (recommended pre business school reading) and received Being Mortal as part of a subscription box – it’s been on my night stand for almost two years now!